In a bowl, mix the rhubarb and gelatin and set aside. Prepare the cake mix according to the directions on the box (using egg whites and substituting unsweetened applesauce for the oil). Spread half of the cake batter into a 9×13 cake pan sprayed with nonstick cooking spray. 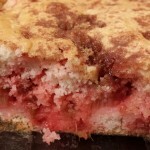 Spread the rhubarb and gelatin mixture over the batter. Sprinkle with two-thirds of the topping mixture. Spread the remaining cake batter over the top. Sprinkle with the remaining topping mixture. Bake at 350F for 40-50 minutes. Serves 15-18.